Our annual training program is organised by a dedicated Training Sub-Committee and includes a Mountain Weekend of two-four days, and several “dryland” days covering competencies and specialist skills. 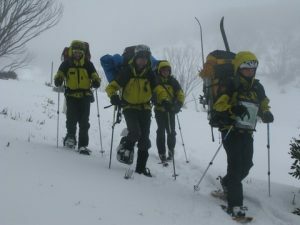 The training program aims to provide members with the skills (both technical and soft) to support our mission to provide well-trained volunteers to BSAR and opportunities for field training in winter alpine environments. In recent years the Mountain Weekend has been held on Mt Bogong, Mt Stirling, Mt Feathertop and the Bogong High Plains.